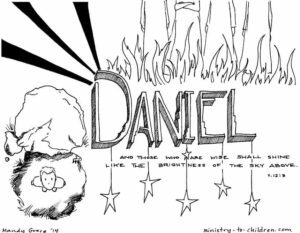 This is the 4th part in a 6 part series on the book of Daniel. Chapter 4 covers: The Vision of a Great Tree, Daniel Interprets the Vision, and The Vision Fulfilled. Don’t miss all our lesson and teaching ideas about the Book of Daniel. Nebuchadnezzar (to Belteshazzar): I was at ease in my house and flourishing in my palace. I saw a dream and it made me fearful; and these fantasies as I lay on my bed and the visions in my mind kept alarming me. So I gave orders to bring into my presence all the wise men of Babylon, that they might make known to me the interpretation of the dream. Then the magicians, the conjurers, the Chaldeans and the diviners came in and I related the dream to them, but they could not make its interpretation known to me. But finally Daniel came in before me, whose name is Belteshazzar according to the name of my god, and in whom is a spirit of the holy gods; and I related the dream to him, saying, ‘O Belteshazzar, chief of the magicians, since I know that a spirit of the holy gods is in you and no mystery baffles you, tell me the visions of my dream which I have seen, along with its interpretation. Belteshazzar: As you wish, your majesty. Nebuchadnezzar: I was looking, and behold, there was a tree in the midst of the earth and its height was great. Nebuchadnezzar: I was looking in the visions in my mind as I lay on my bed, and behold, an angelic watcher, a holy one, descended from heaven. And sets over it the lowliest of men. Nebuchadnezzar: This is the dream which I, King Nebuchadnezzar, have seen. Now you, Belteshazzar, tell me its interpretation, inasmuch as none of the wise men of my kingdom is able to make known to me the interpretation; but you are able, for a spirit of the holy gods is in you. Narrator: Then Daniel, whose name is Belteshazzar, was appalled for a while as his thoughts alarmed him. Nebuchadnezzar: Belteshazzar, do not let the dream or its interpretation alarm you. Belteshazzar: It is you, O king; for you have become great and grown strong, and your majesty has become great and reached to the sky and your dominion to the end of the earth. Belteshazzar: This is the interpretation, O king, and this is the decree of the Most High, which has come upon my lord the king: that you be driven away from mankind and your dwelling place be with the beasts of the field, and you be given grass to eat like cattle and be drenched with the dew of heaven; and seven periods of time will pass over you, until you recognize that the Most High is ruler over the realm of mankind and bestows it on whomever He wishes. And in that it was commanded to leave the stump with the roots of the tree, your kingdom will be assured to you after you recognize that it is Heaven that rules. Therefore, O king, may my advice be pleasing to you: break away now from your sins by doing righteousness and from your iniquities by showing mercy to the poor, in case there may be a prolonging of your prosperity. Narrator: All this happened to Nebuchadnezzar the king. Narrator: King Nebuchadnezzar was walking on the roof of the royal palace of Babylon. Nebuchadnezzar: Is this not Babylon the great, which I myself have built as a royal residence by the might of my power and for the glory of my majesty? Voice from Heaven: King Nebuchadnezzar, to you it is declared: sovereignty has been removed from you, and you will be driven away from mankind, and your dwelling place will be with the beasts of the field. You will be given grass to eat like cattle, and seven periods of time will pass over you until you recognize that the Most High is ruler over the realm of mankind and bestows it on whomever He wishes. Narrator: Immediately the word concerning Nebuchadnezzar was fulfilled; and he was driven away from mankind and began eating grass like cattle, and his body was drenched with the dew of heaven until his hair had grown like eagles’ feathers and his nails like birds’ claws. At that time my reason returned to me. And my majesty and splendor were restored to me for the glory of my kingdom, and my counselors and my nobles began seeking me out; so I was reestablished in my sovereignty, and surpassing greatness was added to me. Now I, Nebuchadnezzar, praise, exalt and honor the King of heaven, for all His works are true and His ways just, and He is able to humble those who walk in pride. Tony Kummer (Editor) reviewed & updated this page on : February 19, 2019 at 8:25 am. All our content is peer reviewed by our readers, simply leave a comment on any post suggest an update.